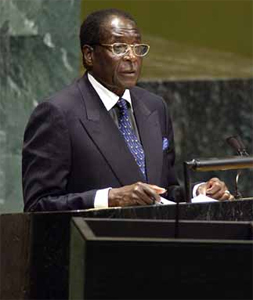 Zimbabew president Robert Mugabe has said gay people are "worse than dogs and pigs"
Gay rights activists in Zimbabwe have demanded to be recognised in the country’s new Constitution which is currently being drafted. In a statement to the Zimbabwe Times, the Gays and Lesbians Association of Zimbabwe, GALZ, said: “The purpose of a Constitution is to protect vulnerable and marginalised minorities. “Most gay and lesbian people in Zimbabwe live in fear and are driven underground. This is blatant discrimination against a group of people whose only difference from the majority is in who they are attracted to sexually. GALZ also highlighted the issue of lesbians being more vulnerable to discrimination than gay men. “On the other hand,” said the statement, “whilst sexual conduct between women is not criminalised in Zimbabwe, the mere fact that there is no specified protection for lesbians under our present constitution makes them equally vulnerable to discrimination as their male counterparts, perhaps even more so, given their status as women who are generally not recognised as having the right to their own sexuality. He has warned against the dangers of homosexuality and threatened pro-gay clergy with prison sentences.